Last Saturday, I had to drop my daughter off at the crack of dawn for a track meet. So, I headed down to Audubon for a nice long walk. I knew it was going to be the last day of sun for several days to come, because snow was in the forecast again. I snapped a lot of photos that I’ve been posting slowly on Flickr. This one still makes me laugh when I see it. 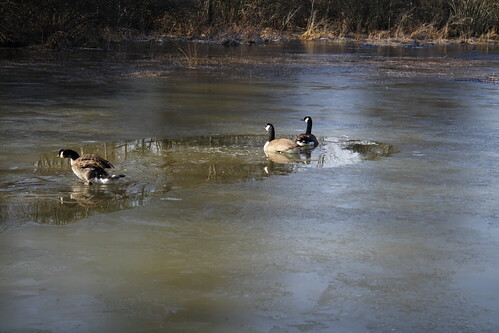 As I walked over the trail which is also a dam for Spatterdock Pond, the geese tried to escape to the safety of the pond. The ice was not quite strong enough to hold them. They walked a few steps on top, then fell through and floundered, flapped, and honked… thus breaking up the ice around them. I wish I could have recorded the sounds for you… the honking, the strange tinkling sound the ice was making, and me – having a laugh at their expense. This entry was posted in birds, spring. Bookmark the permalink.